There are many foods that are staples in my house. Nuts are one of them, more specifically pistachios. My family loves those little green nuts and I always make sure that there is a bag in the cabinet. Of course, that means that we throw out a lot of pistachio shells….and I mean a lot. I recently saw the most adorable craft made out of pistachio shells, which made me wonder just what else I could do with those empty nut shells. 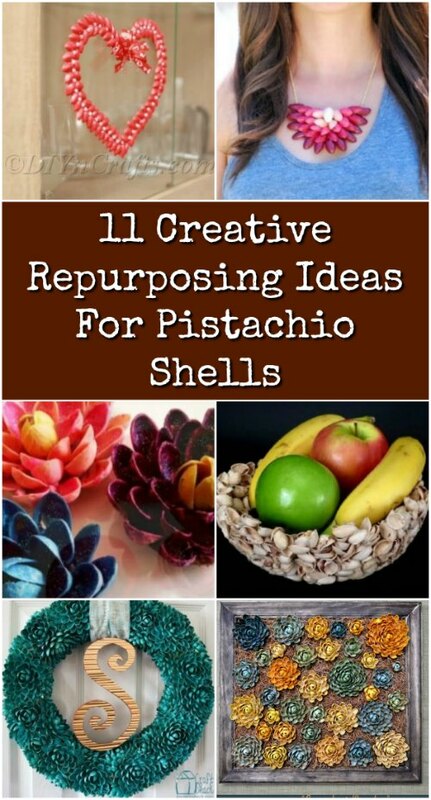 And so, I did some looking around and I came up with 11 creative reuse ideas for pistachio shells. You are going to love these crafts! I mean, if your family tends to go through a lot of pistachios then you definitely want something to do with the shells, right? These pistachio shell crafts are so much fun and they are all so easy to do. Is there anything that cannot be recycled? Just look at these 35 DIY repurposing ideas for cardboard boxes. I do love reusing things and I love that there are crafts that will put my pistachio shells to good use. So, I started saving them and now I just have to pick which one of these fun crafts I want to do first. There are so many wonderful ideas and such beautiful things that you can create from pistachio shells. I can’t wait to try them all, and I can’t wait for you to try them, too. Oh, and if you love repurposing as much as I do, you will absolutely want to look at these 25 bottle cap upcycling projects. Crafts made out of pistachios are all the rage right now! If you’re looking for a fun pistachio DIY project to celebrate Valentine’s Day, check out our latest video tutorial. 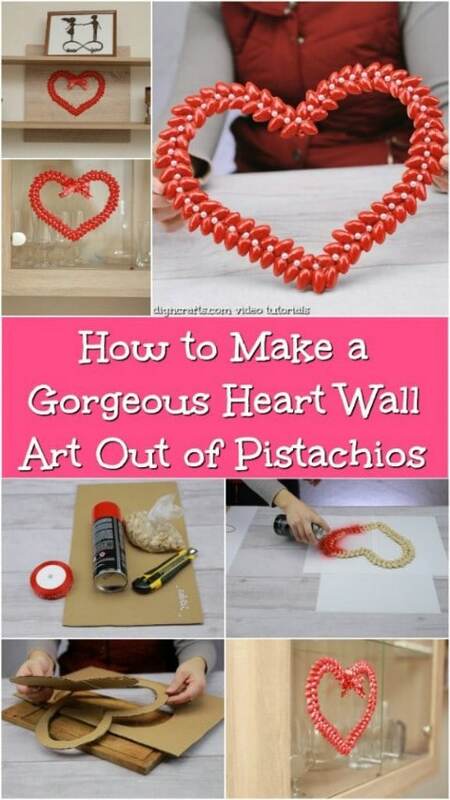 You’ll learn how you can make a beautiful heart decoration out of pistachio shells! I know, I know – Christmas is over. But that doesn’t mean that you can’t start planning for next year, right? 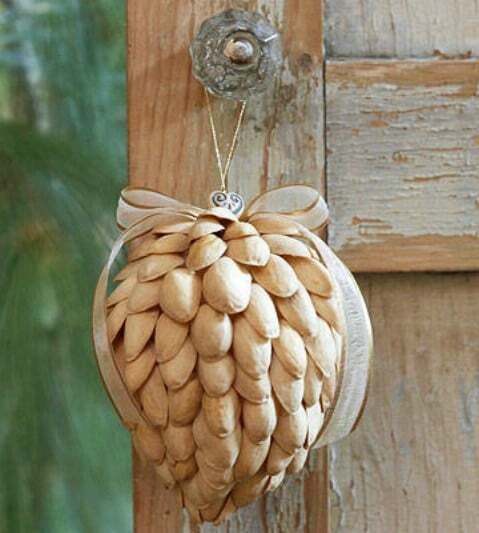 This DIY pistachio shell Christmas ornament is beautiful, and it is really easy to make. 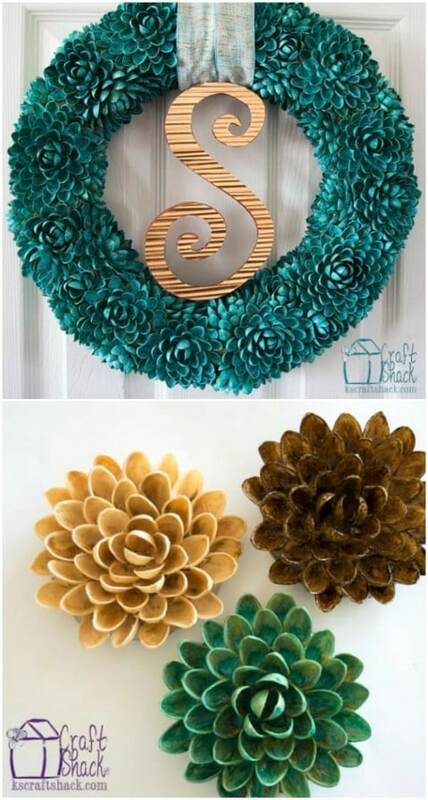 You could do these in different sizes for the tree or just hang them on the porch or on a doorknob. You could also paint them any number of holiday colors. Don’t you just love DIY Christmas ornaments? You can create all sorts of mosaic art with those empty pistachio shells. Add them to your kids’ macaroni art supplies and they can make mosaic art all through the winter months. These are really cute, and they leave so much room for imagination. If your kids need a project to keep them busy indoors when it’s too cold to get outdoors, these pistachio nut mosaics are the perfect thing. This lovely brooch is made from empty pistachio shells and it rivals anything that you will find in a jewelry store. If you love jewelry, particularly homemade jewelry, and you have an abundance of pistachio shells on hand, you can make this one. It’s a great one to give as a gift, too. 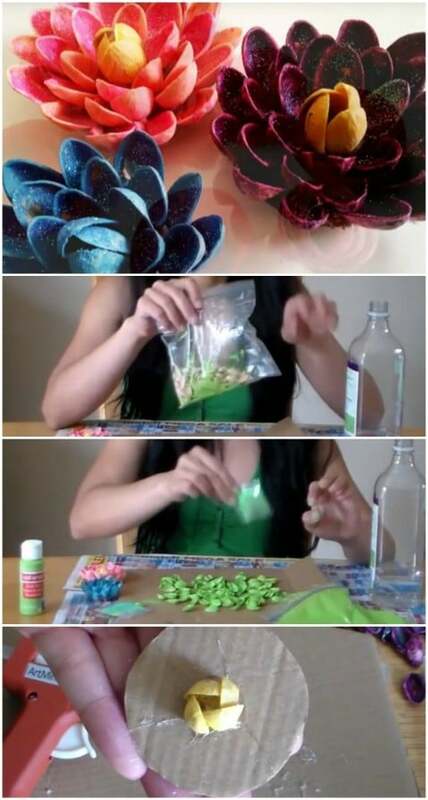 Add in some beads to look like pearls. This is an easy one even if you don’t typically make your own jewelry. How cute would this be for moms – you could do one pearl for each little one – kind of like all of their peas in a pod! If you want a hanging succulent garden but you don’t really want to deal with planting and caring for succulents, this faux succulent garden is perfect. What’s great about this one is that you make it from pistachio shells so there is literally no maintenance once it’s done. Hang this one on the porch or in the garden to add some extra color or you can even hang it indoors. 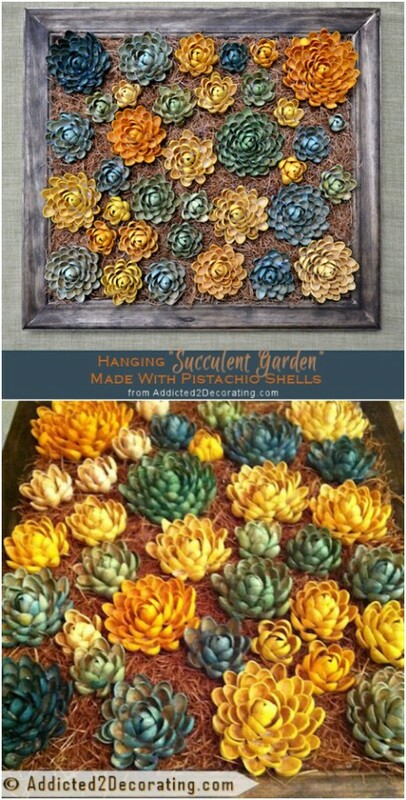 You definitely want to add this to your list of DIY succulent gardens, even if it isn’t actually real. 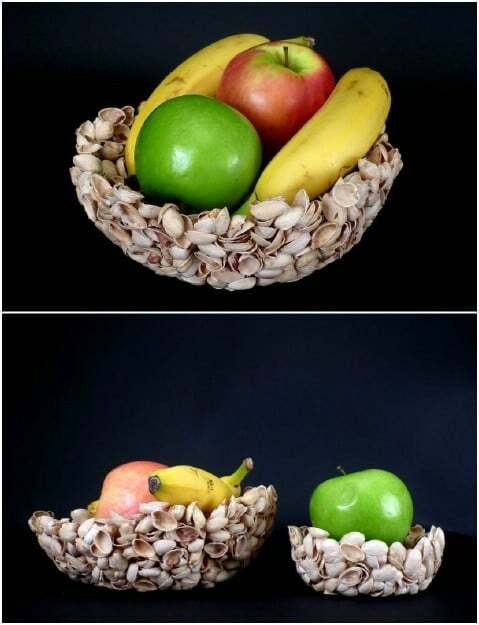 I love this DIY fruit bowl that you can make from those leftover pistachio shells. This one is really simple to put together and you have so many options to decorate it. Add in some color by painting the shells first – you can use nail polish to paint them – or you could spray paint the entire bowl once you get it finished. This would make a wonderful DIY gift for an upcoming wedding or any special occasion. Lotus flowers are so gorgeous, even when you make your own from pistachio shells. I love how easy these are and how flexible. You can do them in any color and use them for all sorts of decorating inside and out. How gorgeous would these be floating in fish bowls? This is a great idea for DIY wedding decor. There are so many possibilities and they are so easy to make that you could have several of them done in an afternoon – provided you have enough pistachio shells. I really do love making my own jewelry so this DIY ombre necklace made from pistachio shells really caught my eye. This one is so much easier to make than it looks, and you could do one in several different colors. 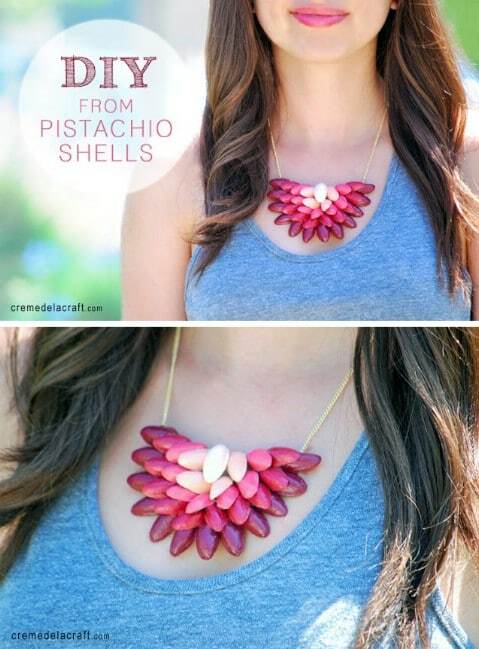 It’s really fashionable, and you only need about 30 or so pistachio shells for each necklace that you want to make. You get more than that in one big bag, so you could even do a few of these for gifts. You can use this DIY tree for decorating anywhere in the house. You make this with pistachio shells, clay and some tree branches. These are super easy, and you have so much room for creativity with this one. Let the little ones help you to gather up some twigs and small branches for making your own pistachio nut trees. Then, you can use them to decorate tables, candles and so many other things inside the house. 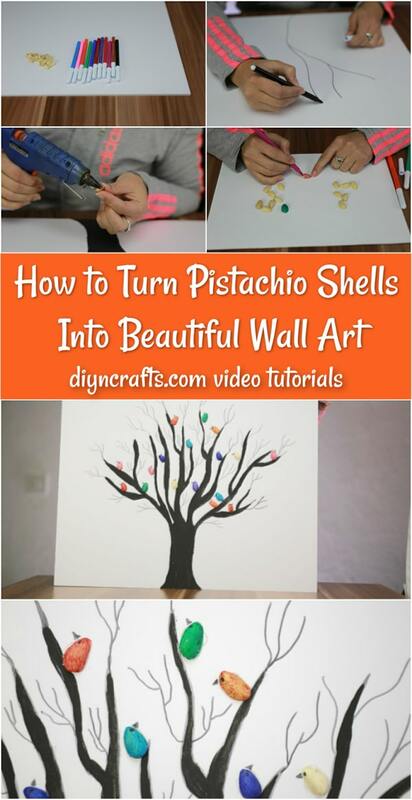 Little ones will adore helping you to create wall art from those empty pistachio shells. This is such a fun and creative way to reuse those shells and when you get your art finished, you could frame it to give it a great museum quality. This is a great project to do with the older kids when the weather gets rough this winter. And, you get to be as creative as you want to be! You will need a wreath form to create this one. Once you have a form, you just layer those pistachio shells around it to create this gorgeous wreath. This would be great for any season – just paint it if you want. You can choose colors that are perfect for any holiday or season or you could just leave the shells in their natural color. These would be great as gifts for housewarmings or upcoming weddings. Add in a wooden letter to create a personalized monogrammed wreath for someone special! I like the flowers and things you can make from LOTS of the flowers, like the wreath. The wreath almost looks like it displays a money sign at first glance, from the “S” and the 2 pieces of ribbon right above, so I’d probably avoid it. I was least impressed with the “fruit bowl” and don’t understand how that makes a lovely gift for a special occasion. I would have at least painted, added some glitter, some other decorative effect. And still not give at a wedding.